Lafitte’s Blacksmith Shop is the oldest bar in the United States. Sort of. Sitting at the corner of St. Philip Street and Bourbon Street in the French Quarter of New Orleans, Louisiana, Laffite’s Blacksmith Shop is actually the oldest structure in the United States that houses a bar. There are legends about the building being owned by Jean Lafitte but due to his role as a somewhat famous privateer, and the complete lack of documentation there is a chance that it is really just a story that has been passed down for several generations. The stories include that the fireplace in the middle of the bar were once used to melt down stolen gold, but like most of the shops stories, they may just be that. It is known that associates of Jean Lafitte operated a blacksmithing shop on the location so there is good reason for the name. 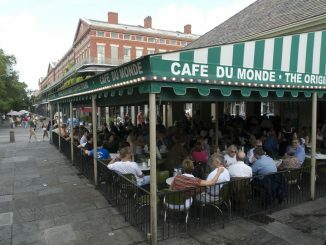 If you are in New Orleans and want to sit in a really old building and have a beer this is the place to do it. Never mind the amazing architecture all around the city and the thousands of live bands playing every night. Lafitte’s Blacksmith Shop is the place to be. The building escaped two large fires at the turn of the 18th century thanks largely to its heavy slate. Jean Lafitte was a known pirate and privateer, but became a local hero of the Battle of New Orleans. 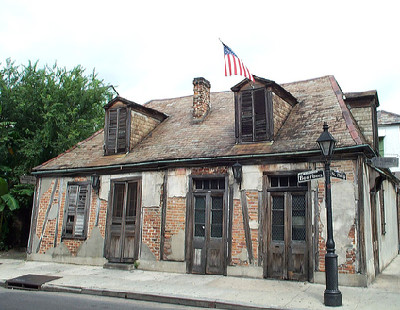 Lafitte’s is one of the only surviving examples of the French Colonial style in the French Quarter. It is considered one of the most haunted buildings in New Orleans. There is a better than likely chance that it was never actually a functioning black smith shop. It may have been used as a cover story.